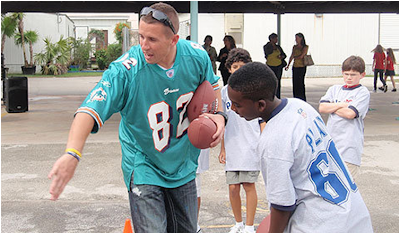 Miami Dolphins wide receiver Brian Hartline visited Sunset Elementary in Coral Gables to participate in NFL PLAY 60, the league's youth health and fitness campaign. Fifth graders at Sunset Elementary took part in the NFL PLAY 60 Challenge - a Super Bowl program that taught students the importance of getting 60 minutes of daily physical activity. Cleveland Browns running back/kick returner Josh Cribbs was also in attendance. The Play 60 Challenge, developed in conjunction with the American Heart Association, is the primary in-school curriculum for NFL PLAY 60. Over 14,000 South Florida 4th and 5th graders participated in the Challenge in the months leading up to Super Bowl Week.